After 20 years of lugging gear and setting up equipment for the Blue Oyster Cult, Jimmy (Ron Eldard) is unceremoniously fired and abandoned by the band members he considered to be friends. With no identity outside of his status as a roadie and no life plans, Jimmy ends up heading back home for the first time in a decade. After crashing in his old bedroom, Jimmy comes into contact with Randy (Bobby Cannavale), his high-school nemesis who happens to be married to Nikki (Jill Hennessey), an old flame he never really got over. With nothing to show for his time away from home, Jimmy begins making up stories and eventually draws Randy's ire, creating an uncomfortable situation that further messes with Jimmy's already fragile mental state. Roadie is like a conflict between two mountain goats (I know that "bighorn sheep" would be a more scientifically correct title but "mountain goat" just sounds better): one goat represents the acting in this film, chiefly that of Eldard, and the other represents the storyline and general exposition of said storyline. The Acting Goat is an outstanding specimen. Eldard is one of my very favorite character actors, a guy who always draws my attention no matter how big or small his role in a given movie may be. (This makes him a member of the "Barry Pepper All-Stars", a list of actors I really need to write a piece about one of these days.) This is a rare leading role for Eldard and he shines brilliantly. Jimmy is easy to root for despite not really showing many qualities that usually make one likeable and that is due to Eldard's ability to convey a measure of truthfulness, or perhaps relevance, to his character. The lack of purpose and the search for meaning in his life work make Jimmy an appealing protagonist in this sort of slow-paced, character-driven drama. There is also an edge of genuine desperation to Jimmy and through this trait Eldard gives real weight to a character which otherwise might have been pointless. The supporting players around Eldard are all solid as well, though none quite measure up to the work of the leading man. The Story Goat, however, is an equally impressive beast but one that works for evil instead of good. 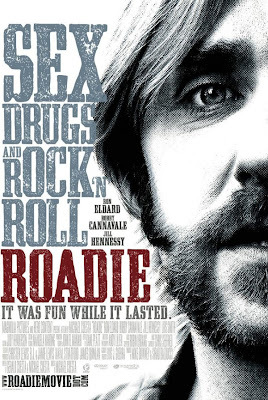 Simply put, the events of Roadie are about as bland as you can get. It isn't what I would call "boring" necessarily and yet nothing much happens. Jimmy comes into town, Jimmy pals around with some old friends, and then Jimmy threatens to leave town once more. That's about it. The settings that Roadie inhabits are uninteresting and the dialogue within is unimpressive. As a result, the story undermines Eldard's work and leaves him virtually trapped in a dull and somewhat meaningless world that serves as a stark contrast to the appealing lead character. In the end, neither the Acting Goat nor the Story Goat really win; instead, the two tire out and settle in for a nice nap, a genuine shame considering all that this film had going for it.